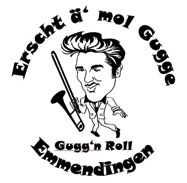 The Emmendingen band, Erscht ä' mol Gugge, had previously played in Newark and their eclectic style of music had proved a big hit as they played ad hoc around the town. As a result they had been asked back to appear in the Carnival procession. Here's a short video clip of the traffic chaos that ensued. Click on their logo left to go to their Facebook page. There will be a photo page shortly…hopefully! Erscht ä' mol Gugge Causing Traffic Chaos in Newark from Max Cope on Vimeo.